When programming you sometimes want to return multiple values from a function. The problem is that many languages only support one return value per function. A commonly used solution is to pass values by reference as input parameters to the function and “misuse” these as output parameters. Some languages (or libraries) – e. g. Swift – provide a tuple type where you can pack multiple values together so you can return multiple values as a tuple. You can also put your return values in some other kind of container, e. g. a dictionary or an array. All these solutions have their pitfalls, mostly some kind of loosing the type of the return values or having to box and unbox primitive values or just being cumbersome or hard to read. Recently I came up with another idea how to get multiple return values from a function: If the used language supports some sort of closures (e. g. blocks in Obj-C) simply let the caller pass a closure that receives the return values with their proper types and call that closure to return the values. Let’s create a class extension to NSArray that assumes the array just contains NSString objects and searches for the string that appears most often in that array. The result values are the number of occurrences of the string and the string itself. To me, the corners in iOS 7 look much smoother and organic. These new corners are everywhere in iOS 7. One reason for this is that as a developer you get these new corners for free. 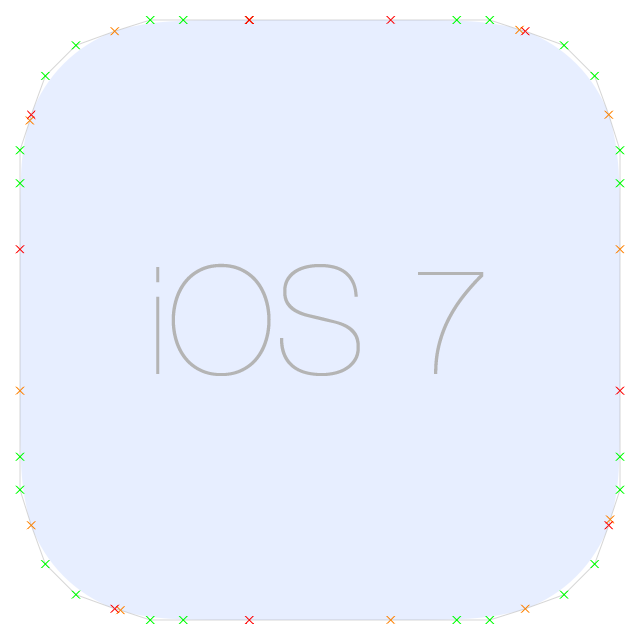 Whenever you use the existing functions of the operating system to create rounded corners, you get the improved ones in iOS 7, e. g. when calling [UIBezierPath bezierPathWithRoundedRect:cornerRadius:]. You see that not many pixels have changed, even at this big size, but nevertheless it has some subtle but perceptible impact in how the corners look and feel. A red cross marks every point where a straight line is drawn to. 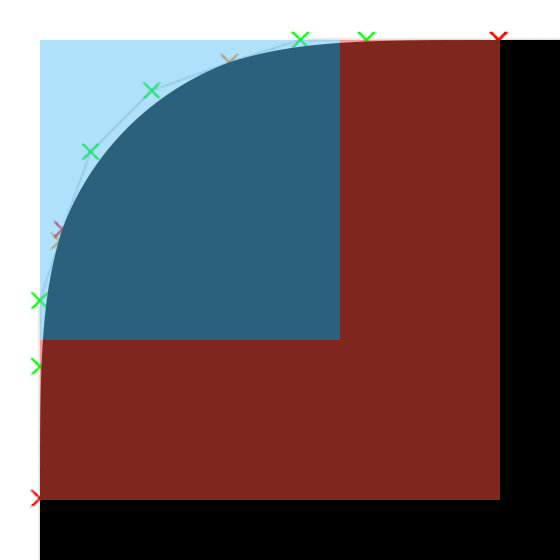 An orange cross with two green control points in between define a bezier curve. As you can see there are four little points where the path is not perfect yet: there are four (very) short straight lines from a curve end point (orange) to a new point (red) very closely together. These unnecessary four short lines can be stripped out of the path; maybe this will be fixed in the final version of iOS 7. 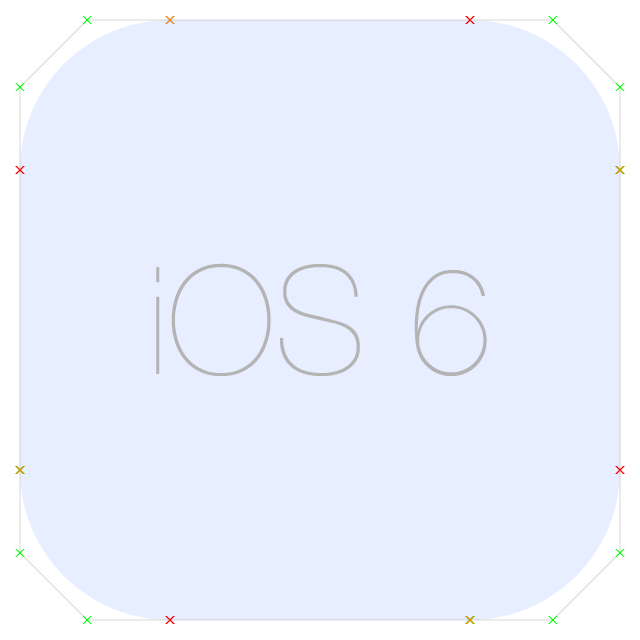 Update: Together with @flarup and @marcedwards we tried to figure out the exact radius for the corners being used for the app icons in iOS 7. Additionally I filtered out the annoying short lines metioned above and exported the UIBezierPath as SVG file. 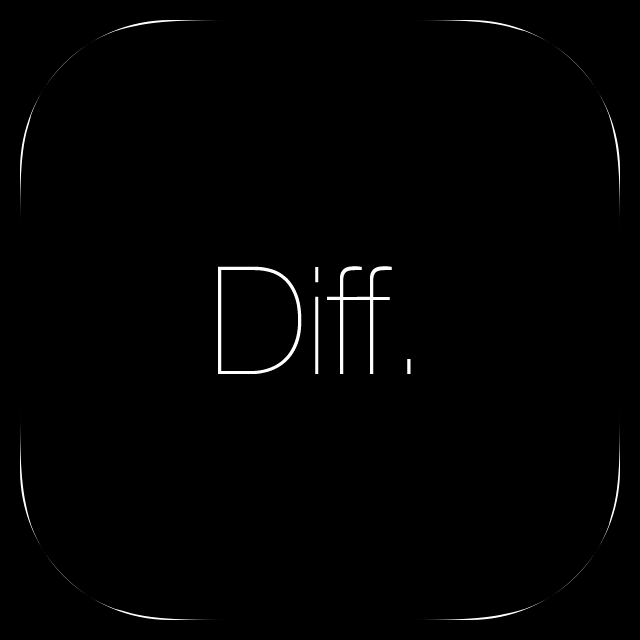 As far as we can see a radius of 27 pixels at 120×120 pixel icon size produces a pretty good match. Download it here. I recently stumbled over a strange case when using blocks. You see, we have a stack based variable value here that is used by blocks that are executed outside the living context of the variable value. Therefore the value variable gets “captured” by the block and a copy is made. This is true for all cases – except for the case where I pass the value variable by reference to a function! I don’t see any reason why the variable should not be captured in this case. In my opinion the blockTestByReference case should behave exactly like the direct case, because in both cases value is referencing exacly the same variable. Any comments? Did I miss something in the specification of blocks, or did a discover a bug in the compiler? So the compiler is really correct here. One must be very careful when using variables declared by reference in blocks! Today I want to write a bit about memory management and how I do it in my projects. Memory management is always an issue when writing programs, programmers have to know what they are doing, and there are some strategies how to handle it. Because I am doing OS X and iOS development most of the time and at the same time have specialized myself in cross-platform model programming, this article will focus on solutions I use in my daily work in these areas. While everybody talks about Manual Reference Counting or Garbage Collection (GC) or Automatic Reference Counting (ARC) when doing Cocoa development, I rarely hear Resource Acquisition Is Initialization (RAII). So maybe this is something new for the one or the other, although the idea of RAII is not so new, as you will see. When managing memory manually, it’s entirely up to the programmer when and how much memory to allocate and when to free it. This style should not be used anymore. Never. There are a lot of alternatives to this approach. This was used when programming “the old way” in C or C++, when alternative techniques where not so widely known, but you usually don’t see this anymore in modern code. You can easily forget to free the allocated memory block resulting in a memory leak. Things get very complicated soon when you pass around pointers to allocated blocks of memory this way. The problem is to figure out when (and how) to free the allocated memory. Because there are no memory management concepts used here, there is no general solution to this problem and the programmer makes errors for sure as the code grows. When doing Cocoa development and programming in Objective-C, one of the first things you learn is how to create and manage objects. In your code you write classes and instantiate objects of classes. One of the most important concepts in Cocoa is that every class should inherit from the base class NSObject and this class contains a retain counter. Every time you create or otherwise want to “own” an object, you increase the retain counter and once you don’t need the object anymore, you decrement this counter in your code through some special methods provided by NSObject, like retain, release or autorelease. When the retain counter falls back to zero, the object is automatically deleted. You never inspect the retain counter and you never delete objects by yourself anymore. You just follow a few very simple rules, any everything will be alright. No memory leaks or dangling pointers. Reference Counting is a simple but effective concept about the ownership of objects. Some programming languages provide automatic garbage collection with sophisticated algorithms, so you don’t have to care about your memory management. If you don’t reference to objects anymore, they get freed. Hopefully. At some time. This has pros and cons, but I personally never was a big fan of garbage collection. Apple introduced a garbage collection solution for OS X programming (starting with OS X 10.5), but it never got its way into iOS and it does not seem to be very encouraged anymore. Everybody is talking about ARC (automatic reference counting) nowadays. Note that you never have to call any code to “release” or “free” your object. The garbage collector does this magic for you. This is very convenient for the programmer, but does not come without cost. The garbage collector needs processor power, your application usually consumes more memory, and you never know when exactly your objects get freed. A relatively new technology introduced for the Objective-C language is ARC (Automatic Reference Counting). This technique is basically the same as reference counting, but the compiler inserts the necessary retain and release calls by itself. So the manual counting becomes automatic. Basically it feels a lot like writing garbage collected code, but there is no garbage collector at runtime. You still have to know a bit about memory management, e. g. you have to avoid retain cycles by wisely declaring your references “strong” or “weak” (something you don’t have to worry about in garbage collected code), but the reference counting itself is completely controlled by the compiler. Programmers don’t have the ability anymore to increment or decrement the retain counter explicitly. ARC has some advantages over garbage collection. Objects are always deleted immediately whenever they are no longer referenced and there is no additional processing power needed. When using garbage collecting, all your used code and libraries have to be prepared to run under garbage collecting, but not so for ARC: you can mix ARC and Non-ARC code at will. To use ARC you need the relatively new LLVM compiler. Currently there is a lot of buzz around ARC in the OS X and iOS developer scene. This will allocate a block of memory of 100 bytes. This block is automatically freed when the code exits the scope of the block variable. This is also true for exceptions. RAII is one of the basic concepts used for implementing smart pointers (shared_ptr) provided by either the boost library or the new C++11 language standard. The basic idea of RAII is to combine two relating steps into one inseparable step: opening and closing a file, allocating and freeing memory, … or: retaining and releasing a reference counter! Unfortunately there is no built-in support for the RAII idiom when using Cocoa. Objective-C objects are always created on the heap and referenced through a raw pointer; they can not be statically allocated and there is no concept of a smart pointer. Still, I am using RAII a lot in my OS X and iOS code. As said above, I specialized in writing cross-platform code. Although I love to code in Objective-C and write native UI code for OS X or iOS, I always searched for the best techniques to do cross-platform programming for the internal model of my apps. In my opinion, (Not Your Father’s) C++ is the way to go here. I used Java for some time, but although it’s a great language and it has its use cases or sure, it has not established well for end user software on desktop systems. Finally, on iOS Java is not available at all. First of all, when holding references to objects of C++ classes, I always use smart pointers (boost::shared_ptr or std::shared_ptr). Everybody who used smart pointers knows what I am talking about. You never have to delete your objects yourself, they get automatically deleted whenever the lifetime of last referencing smart pointer ends. Using raw pointers to C++ objects is very discouraged. While I think C++ (correctly used) is a very great language, in my opinion it lacks of good libraries. There is a lot of C++ code in the wild, but I never saw a good library (apart from boost) with great concepts that can be used as base for your apps. The language itself just provides some wicked containers and algorithms and things like that (that are great for specific needs), but that’s it. I think this is the biggest advantage of Cocoa: it provides an insanely great set of classes that are so simple but powerful. It makes fun to write code in Cocoa. It’s just like building worlds by using LEGO bricks. Expressed with some exaggeration, with plain C++ it’s like having a machine that can be used to build a machine that could eventually build LEGO bricks so you can finally start to build your world. But you’re far away from a usable set of reusable bricks. The very first thing I noticed in C++ is the lack of a good string class. I mean a real string class usable for human readable text. There is a string class in C++, but that’s a very dumb class. It’s for the “literal” meaning of “string”: a linear concatenation of objects (e.g. characters). But that’s it. The std::string class does not know what “text” is. There are no compare methods, there is no Unicode support, there’s nothing. It’s just a simple sequence of characters. Additionally, when using the std::wstring class you have the problem that wchar_t may have different size on different platforms and so on. So every time you start to code in C++ the very first thing you need is a usable string class, especially if you tend to write end user applications with UI. A user interface of an application uses text to communicate with the user in almost every case. I’ve not seen many end user applications that don’t use text of any sort. So, dealing with text is essential for a programmer! Unfortunately C++ does not help here much out of the box. As a resulting side effect, if you start to use third party C++ libraries, you’ll see very soon that many of these libraries provide their own string implementation. That’s not good. But that’s the way it currently is. In contrast, think about a Cocoa library from a third party: It’s totally natural (and convenient) to use NSString for text here – nobody would ever came to the idea to write his own string class to use in a Cocoa library. You see mani::String objects can be created and used in various ways (only a very small set of possibilities is shown here) and you never have to care about retaining or releasing your objects, the same way as with smart pointers. It’s all done automatically using the RAII principle. Objects are freed automatically as soon as they are not used anymore. And you don’t need a garbage collector, and you don’t need a new compiler that does statical analysis and inserts code for you. It’s a simple old but robust technique provided by every C++ compiler based on the lifetime of variables. Of course I can convert easily between mani::String and NSString; this is needed to communicate between UI code and model code. And because I have the source of maniCore I can extend it at any time and adapt for my needs. Currently maniCore is private, but maybe I will release it to the public at some time in the future. I find it very handy, especially for cross-platform projects. When getting objects out of a Core Foundation or Cocoa Container, you always have to know what type they are. The container itself doesn’t do any type checking here. In Cocoa the getter usually just returns objects of type id and this is implicitly casted to the type of your variable by the compiler. When directly using the C-API of Core Foundation you usually have to cast the type yourself. I want to avoid casting in the higher level code that uses maniCore and because of the stricter type system of C++ I had to specify the type in the getter of my C++ wrapper. I did that with some template magic and I ended up with the nice verbose get<Type> solution, that even can do type checking, if desired (e.g. in the Debug build). The overwritten operator* returns the internal Cocoa pointer for easy usage. Note that you don’t have to think about overwriting dealloc and free the instance variable. It’s done automatically. You see there are a lot of things possible when mixing C++ and Objective-C. Although C++ is a very old language, I am still a huge fan of it and wanted to demonstrate that a modern usage of C++ is not the way as most people have seen in their life. There is a lot of cryptic and ugly C++ code out there. Don’t use it this way. C++ has a lot of possibilites, that makes it difficult and requires a lot of knowledge and discipline to use it “the right way”, but I don’t like it when people argue “Objective-C is better” or “C++ is a hell of a language” etc. When used in a modern and smart way it has cool features. I demonstrated how I use it to write cross-platform code in a style that’s pretty comparable to Cocoa using ARC. I love to write Objective-C code but I also love to write good C++ code and became kind of an expert in combining both together. I am working on a project where I have a (view based) NSTableView that should display a value in each row. These values are calculated from other values that are fetched from a database. While the performance of getting one single value is acceptably fast (under 0.1 seconds) for other use cases of the application, this sums up in the table view and noticably blocks the user interface whenever the table needs to be reloaded or when scrolling through the table. My first idea was to calculate the values in a separate thread and then update the GUI whenever a value is available. Problem here is that the model is not thread-safe at this point and that would be a ton of work to change. So for every requested table row I add a new block to a queue that runs on a separate thread and processes its blocks in serial order. These blocks, processed on a separate thread, do just one thing: they add another block to the main queue and wait until this block is processed (dispatch_sync) before adding the next block. Finally these blocks, processed on the main thread, calculate the row values and update the GUI like before. Because of this transitions from the separate thread to the main thread, the main runloop gets a chance to process other events between every value calculation. I find it interesting how much complicated work can be expressed in so few lines of code. Writing all this functionality “by hand” without using Grand Central Dispatch and Blocks would make it very complicated and probably less efficient. We are writing portable cross-platform software, primarily running on Macs, Windows PCs, iPhones and iPads. Recently we had a problem to solve, that I’ll describe here. Our code uses Apple’s CoreFoundation. On Mac OS X or iPhone OS it’s “just there” as part of the System Frameworks, and on Windows we use CoreFoundation in form of the great OpenCFLite port. Now we had a project where we’re also using Apple’s QuickTime. Again, on the Mac it’s “just there”, but on Windows we have to use the QuickTime SDK for Windows. Now when trying to build this project that uses both CoreFoundation and QuickTime on Windows, we got a lot of Linker errors complaining about duplicate symbols. The reason is that the QuickTime SDK for Windows itself contains its own subset of CoreFoundation. So we searched for a solution. I already had the idea to write a wrapper around all necessary QuickTime calls and move this wrapper into a DLL to separate the QuickTime stuff from the main binary. So QuickTime called from the wrapper DLL uses its own embedded CoreFoundation implementation, and the main binary can still use OpenCFLite. Most probably there are some things to keep in mind, e.g. the API to the QuickTime wrapper must not pass any CoreFoundation objects across the boundary. CFStringRefs had to be passed e.g. as plain C strings UTF-8 encoded and the CFStringRef has then to be reconstructed from that inside the wrapper. But all this shouldn’t be much of a problem. But we were not 100% sure if our theory really solves the problem, or wether there is an easier solution. Maybe some secret linking tricks or something like that. We thought somebody else must already had the same problem!? And, yes, it came to my mind that the developers of WebKit – the engine of Apple’s web browser Safari – must have solved that. I know that WebKit uses CoreFoundation. And I also was pretty sure that WebKit uses QuickTime for displaying Video. Luckily WebKit is open source, so I downloaded the WebKit sources and digged into them to see if the WebKit engineers had the same problem and how they solved it. Short time later I had the answer. Really, they obviously are in the same boat. And it was solved pretty much the same way as the idea that I already had in my mind. WebKit contains classes like “QTMovieWin” that are build into a separate DLL. So all QuickTime calls are done in those special wrapper classes from the DLL and WebKit itself does not directly call any QuickTime routines. Behind the scenes we’re working on great stuff that requires the phantastic Boost libraries. Unfortunately building those libraries isn’t always that easy. Starting with Snow Leopard and its Xcode 3.2 we were no longer able to build universal binaries of Boost the way we used to. After reading a lot of articles and forums for a solution (none of them worked for us) we came up with our own solution. The goal: we want to have 4-way universal binaries of static Boost libraries. That is PowerPC 32-Bit, PowerPC 64-Bit, Intel 32-Bit, and Intel 64-Bit. The problem: As soon as we tried to use address-model=32_64 in the bjam command we just got weird errors. The solution: It’s pretty easy; just avoid compiling for multiple architectures at once. We solved the problem by compiling for each architecture separately and finally putting things together into universal binaries using the lipo tool. I wrote a perl script to accomplish that. Please be aware that I’m not a very experienced scripter. My primary programming languages are Obj-C, C++, and Java, but I avoid scripting whenever possible. So the following script may be by far not the best solution and I “hacked” it together for our own purposes only. The script is currently working for Boost 1.40 and the resulting binaries are installed into /build_external. The way we build the Boost libraries they should be usable on any PPC- or Intel-Mac running Mac OS X 10.4 (Tiger) or later in 32-Bit and 64-Bit applications. Feel free to use the script and adapt it for your specific needs. Use at your own risk. # - Extract the boost source archive and cd into the extracted folder (e.g. "boost_1_40_0"). We’re working on very interesting stuff for new products behind the scenes. It’s a special challenge to write cross platform code. For that reason we are creating a very solid code base that we can reuse in all future products. 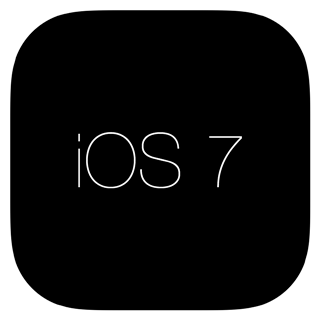 We decided to use C++ and wanted to support Mac OS X, Windows, iPhone OS and potentually Linux. Maybe I’ll write more about our concepts and decisions about that in a future post, but for now I’ll concentrate on Boost. You need a Mac with Mac OS X and installed iPhone SDK, of course. Download the Boost sources and extract them somewhere on your hard disc. You have to adjust the paths if you have installed the iPhone SDK at a different location. Replace /path/for/BoostiPhoneDeviceLibs with the path were you want to have the final Boost libraries and headers located. Replace /path/for/BoostiPhoneSimulatorLibs with the path were you want to have the final Boost libraries and headers located. 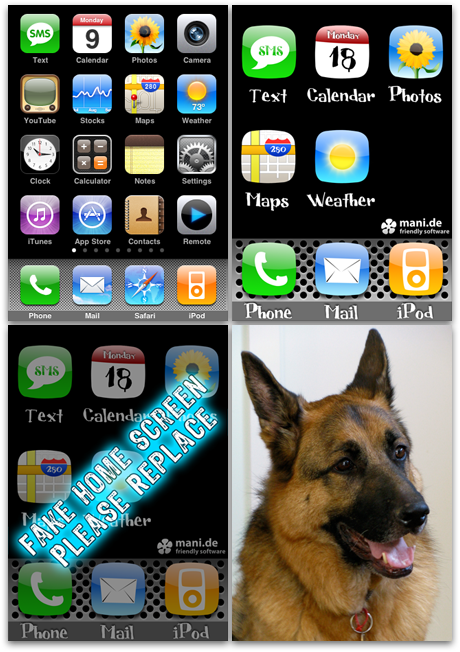 Unfortunately there are a few errors and warnings when building Boost for the iPhone this way. But because we currently do not use the affected classes yet, we did not spend much time into that.